This Birmingham contemporary arts centre is an exciting venue with over a million visitors a year and a programme that celebrates the work of disabled artists. What we love most about mac Birmingham is the friendly attitude of their staff and the exciting variety of accessible workshops to choose from! Here Jess Wolinski tells us more about the fun and accessibility at the Midlands’ most visited arts centre. The mac Birmingham building looks very interesting, and you list many innovative adjustments including different contrasting floor colours to indicate changing floor gradients. In what other ways has this building been made accessible for visitors? I think mac is a wonderfully accessible building, and I hope that everyone coming for a visit feels welcome, safe and comfortable. We have level, gently sloping or permanently ramped access into and throughout the building, as well as two lifts servicing all floors, meaning that in our large and complex venue, nowhere is off-limits to any customer. The contrasting carpet colours is one of my favourite features: where the gradient of the floor changes, so does the carpet! It’s so simple, but makes a big difference to some customers. Accessible unisex toilets are available on every floor, and all are fitted with alarm chords that hang to the floor. A toilet with a hoist, changing bed and shower is situated discretely on the Lower Ground Floor, and we have another portable changing bed that can be moved around the building if a bigger room is needed. There are so many other features as well, including hearing loop systems, a first aid room and emergency call buttons throughout the building. But we know that more can always be done to improve and keep up to date with the latest advances, so we encourage customers to let us know about their experiences and what works well, or what could be improved! It’s excellent that you offer different ways to book tickets. How much choice do wheelchair users have in seating at mac Birmingham performances? Within mac we have lots of different performance venues, from our large Outdoor Arena to the beautiful Hexagon Theatre, the flexible Foyle Studio and the main Theatre. We have designated spaces for wheelchairs in all these auditoria, with neighbouring seats for carers and companions. We keep these off general sale to make sure that they’re available to those who need them, so these are bookable over the phone or in person. These are easily accessible and the views are as good as anywhere in the auditorium. We’ve not yet had a review for an accessible pottery studio on Euan’s Guide! How popular are your pottery courses and how often do they run? Can you tell us more about accessibility in these classes? Our pottery courses are the most popular thing we do! They often sell out as soon as they go on sale. 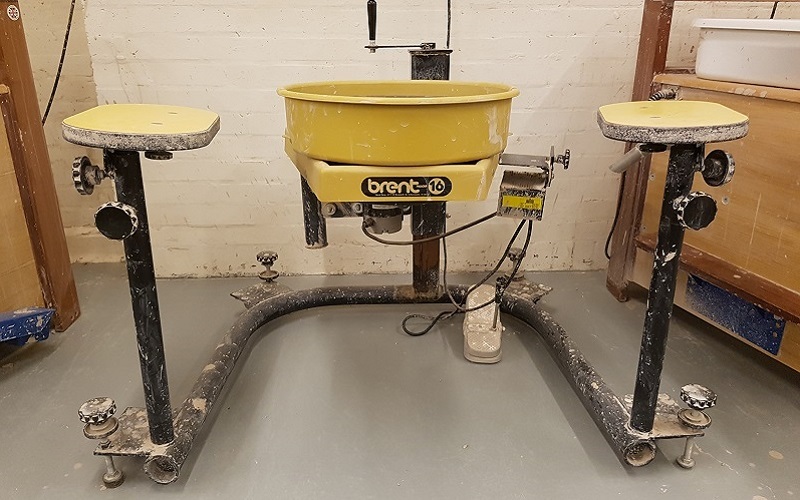 We do have one fully adjustable, wheelchair-accessible pottery wheel, and two wheels with lower seating - but you’ve got to be quick to get your place on one of the courses as space is very limited. However, there are plenty of other creative courses to try your hand at, from jewellery making to painting and drawing, to textiles and stained glass! Any prospective students or carers are encouraged to get in touch with us to discuss specific requirements if they’re unsure if a course is suitable, and we’ll always do our best to make adjustments. You can also attend a free taster session and meet the tutor before you have to commit to a full course, and there are complimentary tickets available for carers or support workers. Over the last 12 weeks I’ve been doing a lino printmaking course which I’d definitely recommend, and I’ve got my eye on textiles class next term. The terms run alongside school terms (September to Christmas, New Year to Easter, and Easter to Summer). Can you tell us a little more about your macAbility sessions? What kinds of courses can people expect to take part in? While people with any disability or additional learning needs are welcome on all of our courses, our macAbility courses are specially designed to provide adapted and supportive learning environments, with tutors experienced in teaching children with Special Educational Needs. They are also run with the help of Learning Support Workers who can provide pastoral care for the group. As part of the Visual Arts programme we have a course called Relaxed Art Explorers which uses creativity to calm and focus the mind and is perfect for children aged 8 to 11 and an accompanying adult. Working both in groups and on individual projects encourages the students to build confidence and develop sharing and social skills. Open Relaxed Theatre is a drama course for young people aged 8 to 13 on the autistic spectrum or with similar conditions, and features lots of music, colourful props and opportunities to discover hidden abilities. Which disabled artists have recently been featured in your programme? We’re lucky to have worked with so many fantastic artists who have brought a wonderful array of stories to our audiences. We host touring performances such as Caty Wompus by Flex Dance, and we screen films such as ‘Notes On Blindness’, ‘Summer In The Forest’ and ‘My Feral Heart’, exploring a diverse range of stories and experiences of people with disabilities. We’ve also been working directly with disabled artists on developing their own work and navigating the industry. We’ve now partnered with DASH Arts twice to host the Awkward Bastards Conference, which aims to challenge and explore the concept of diversity across disability, ethnicity, sexuality, gender and class, and is a really well attended event! We’re also looking forward to hosting the Creative Minds conference later this year, which more specifically looks to discuss quality, leadership, inclusion and collaboration with artists with learning disabilities. We have also developed two in-house disability-led groups. Spectra is our performance group run in partnership with Kate DeRight and Queen Alexandra College, and we also have our resident band, Switch! They’re a group of young musicians who work alongside professional music leaders to write original songs, learn to play instruments and sing, and learn about the many aspects of music production. They have an increasing repertoire of original songs, enjoy regular performance opportunities at mac and beyond, and have even created their own music videos. We also have a close partnership with Sense, the charity that supports people who are deafblind, have sensory impairments or complex needs. Our current project is a free digital and audio instillation which will be presented as part of the Birmingham Weekender festival in September inside John Lewis department store. The work is inspired by the everyday sounds of local Sense residential homes and uses Augmented Reality and Audio Description to shed light on our diverse listening experiences. I think it’s going to be a really innovative and inclusive experience. I’m really looking forward to that. Photo: Café at mac Birmingham – Ben Fearnhead. You say that you are looking to provide a greater range of relaxed events. What else might we expect from mac Birmingham in the future in terms of accessibility? At the moment I think we offer a good range of relaxed events for children, but our provision for adults and young people could be improved. So many people could benefit from a more relaxed performance, learning or cinema experience, but I think we, and many other arts organisations across the country, have mainly focused on what that looks like for children and forget that there are many adults who would appreciate a more relaxed attitude to noise and movement in the auditorium, but still want to see a range of good-quality art for adult audiences.